A few days ago, we discovered that Vogue Spain had been surreptitiously stealing well known photographer, Sion Fullana’s work, and passing it off as their own on Instagram. Since then Vogue Spain has apologised for what has been called a ‘mistake’, and has promised to compensate Fullana. The problem with the apology, however, was that it was so vague, many Instagram users (yes they only posted it on Instagram), had no idea what it was all about. Fullana told The Next Web that he had been contacted by a reporter from Vogue Spain. She informed Fullana that it was all a big mistake, and that the magazine always credits artists for their work. He was promised compensation through a paid collaboration with the magazine. Four days have passed and he hasn’t heard anything further from them. Four days is plenty of time to dig further into the story, and discover that his was not a unique case. Sion Fullana has found that he is far from alone, tweeting that another two photographers, including Animesh Ray, have reported the Vogue Spain account for stealing photos. We performed a reverse image search, and found four photos in the space of just 10 minutes. This image was taken from the website of a store in Madrid. This photo from a store in Paris was posted as far back as 2009. This photo was lifted from a Flickr account. A shot of these stairs was posted on Tumblr last May. The list goes on. While these reverse image searches don’t provide results from Instagram, another photographer has posted screenshots on her account, showing that one of her images was swiped by the magazine. At the time of writing, this image was still posted on Vogue Spain’s account. The problem here isn’t just that someone over at Vogue Spain is trawling the web, stealing photos, and passing them off as their own, it’s that the magazine has not been held accountable. Someone is making a conscious decision to take work produced by someone else, is adding captions, and in the case of Instagram photographs, even adding an additional filter. As Fullana points out on Twitter, not only have they done nothing in the way of a real apology, but many of the ripped off photos are still posted on their account. So they apologise for stealing from artists, but continue to pass off their images as their own. 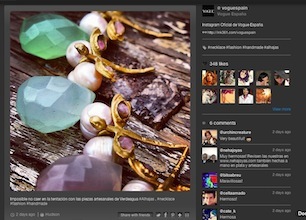 It’s absolutely mind-boggling to find that the very next photo after the ‘apology’ is taken from the website of Spanish jewelry designer Verdegua. While the caption does acknowledge the jewelry designer, it is unclear whether or not permission was actually given to use the image, but given their track record, you can forgive us for being incredibly suspicious. 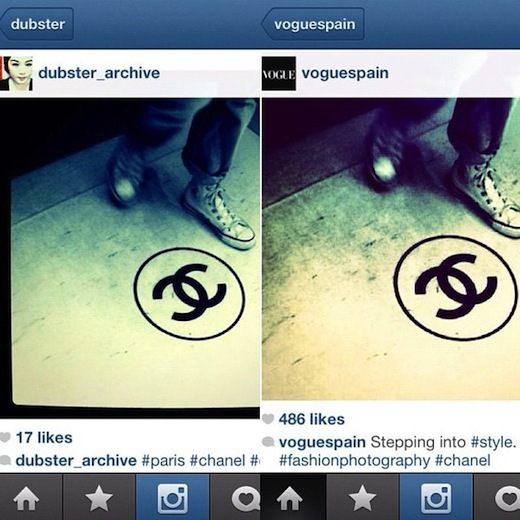 The use of the image reinforces the fact that Vogue Spain just doesn’t get Instagram. If Vogue Spain were to feature Verdegua’s jewelry in its magazine, would it simply lift the images off the website, or would it commission some gorgeous photos of its own? We’re banking on the latter, and we’re not sure why Vogue Spain sees its Instagram account in a different light. Instagram’s terms of service clearly state that you can only post images you own, and Vogue Spain has been on an image-stealing spree not only across the photo-sharing service, but across the entire Web. (1/3) Desde Vogue España manifestamos nuestro malestar por el uso inadecuado de imágenes en Instagram. (2/3) Reiteramos a @sionfullana y la comunidad fotográfica nuestras disculpas por lo sucedido. (3/3) La empresa ha tomado las medidas internas necesarias para que esta reprochable situación no se vuelva a repetir. Fullana also informed us that the magazine has promised to compensate him for the use of his images.